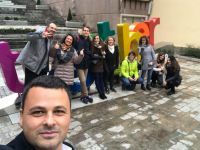 On November 22nd the Consortium met with the other 8 partners from 5 Countries (Belgium, Bulgaria, Italy, Macedonia and Spain) in Plovdiv, Bulgaria, to discuss specific points of FASST (Formazione per Agricoltura Sociale e Sviluppo Territoriale), a Project co-funded by the Erasmus+ Programme of the European Commission. FASST developed 12 Training modules to foster Social Farming entrepreneurial initiatives all over the Europe. Training resources will be available in 5 languages (Bulgarian, English, Italian, Macedonian, Spanish) and published on the FASST OER Platform www.fasstproject.eu. During the meeting, Partners revised the OER (Open Educational Resources) Platform and finalised the training courses developed. Also Partners saw the agreement upon both timeline and delivery of training under the Test and Validation phase as well as the tools and methods to gather feedbacks from participants. Dissemination was a strong and important matter to be talked about since the Partners are fully committed to give as much visibility as possible to the Project. By doing so, a dedicated Multiplier Event will be held in each Project country in the months to come, adding ordinary online and offline dissemination activities. In order to fuel the Project with more visibility and attention for the Project, the Belgian Partner IHF made its presence felt by showcasing its Dissemination Plan, pointing out the best way to find and reach out MEPs (Members of the European Parliament) to involve them at Dissemination level. Copyright © 2017-2019 - All rights reserved.